Watch the grapevine carefully because you’ll be seeing a lot of Kiran Hunter (http://kiranhunter.com/about/) in the near future. As you’ll see from the blog, Kiran’s been writing for a long time but has only just decided to “unleash” all that latent writing talent. Watch out! 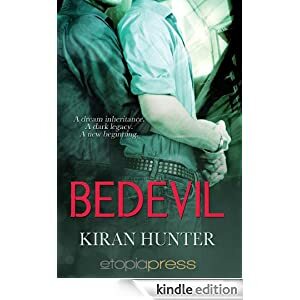 Kiran’s story, Bedevil (http://kiranhunter.com/taste-it/) has just been published by Etopia Press (http://etopiapressblog.wordpress.com/). This short story is immensely readable and entertaining. Kiran Hunter proves to be a wizard at the writing craft, creating well-rounded, memorable characters in few words - characters that I'd very much like to meet again. Gareth inherits a house he's never seen and has no idea of its sinister history. In order to save his cooling relationship with Tim, he moves into the house in the middle of the countryside to avoid the temptations of city life, unaware of who, or what, lurks in the walls of the crumbling abandoned house, nor what its intentions are. The cover of "Bedevil" is a perfect fit for this brilliant story. Kiran Hunter plays with the reader like a cat and brews the horror like a gathering storm. I would love to see the sequel, if there is one, and I would definitely like to see Gareth and Tim again - I miss them already. See? I have the feeling this is just the start of something good. And what I specially liked is this is an M/M story with a different slant to the usual "run of the mill". Definitely unusual. Mind you, in the interview after the cut you'll see that Kiran enjoys "breaking the rules" so I shouldn't be surprised. Sue: Am I right in saying that Bedevil is an M/M paranormal suspense? Is this an unusual genre? Kiran. I think we’re just more used to seeing paranormal and M/M romances, perhaps. This story errs towards the sinister rather than the romantic. In Bedevil the main characters, Gareth and Tim, are already in a relationship… a rocky one… and it might just get rockier. Bedevil is the first part of a story about trying to make a relationship work – finding a way for each other’s differences to… well, not make a difference! It is also about embracing ideas that you might immediately dismiss. Sue: I hope my review will prompt lots of readers, but for anyone still hesitating about buying it, what can you say to them? Kiran: I think Bedevil is a little different. It’s paranormal, but still very much of this world. There are no angels or faeries for instance, although there is a demon. But we all have demons…don’t we? Sue: As I said above, I have a feeling that Kiran Hunter has a lot more fiction just waiting to be launched on the reading public. Any hints about what’s coming? Kiran: The follow up to Bedevil (working title Devilment) is in progress as we speak and I am mid-way through writing an M/M contemporary suspense. There may be more of a ‘romantic’ element to the contemporary story – but this time the themes are trust and control. Sue: Horray! It's wonderful news that there’s going to be a sequel, I hoped there would be. Tell us a couple of things about Kiran that’s not on your blog. Kiran: I can’t drive. Or to be exact, I can drive – I just enjoy driving fast. Too fast. It’s a good thing I don’t have a license LOL. I’m a damn good cook. My idea of a perfect evening is to have a good meal by candlelight (my dining room is full of candles and glass lanterns), with my closest friends, and with plenty of wine. Sue: You should live in Portugal if you like driving fast LOL. You'd be right at home. Is there any author whose writing style you admire (and perhaps would like to emulate)? Kiran: I’m a big horror reader, and I also enjoy darker psychological stories. I like Clive Barker’s writing style very much. Kiran: Well, keeping Gareth entertained would probably be fairly easy… although I think I’d be happy for him to keep me entertained with a story or two ;-) … but I’d like to get Tim to loosen up a bit, he’s wound fairly tight. As I said, I like to cook – so perhaps a meal and plenty of wine would get him to relax and open up a bit. Sue: Tell you what, I’ll keep Tim entertained. I ♥ Tim (except I don’t think he’d be too interested in me). Tell me, what’s on your tbr list at the moment? Kiran: I have Tarantula by Thierry Jonquet waiting for me on my Kindle. I’m also looking forward to the release of The Hun and The General by fellow Etopian author, Tristram La Roche. I’m lucky enough to have had a sneak peak and I love what I’ve seen of Attila – he’s a more complex character than you might expect… and I like that… (Lucky Kiran – I’m so looking forward to that release. Click here to see Tristram's announcement). Thanks for having me Sue, I’m glad you enjoyed Bedevil – it’s just the beginning…. Great interview, great story. Come on Kiran, we want more. Looks very interesting interview. The author is looks really promising. I like horror flicks. I am now getting more and more interested to read it. Sounds like great interview and definitely very interesting questions and answers. I am very impressed with the author.